Michael got me a food processor for Christmas. I asked for one. It was probably the last key piece of equipment I was missing from my kitchen. It is kind of an embarrassing admission. A food processor should be one of the first additions, not the last, but I always seemed to get by without it. After using it once, I can totally see why they're so popular. This machine might change my life. As I was using my shiny new food processor for the first time I couldn't help but think about when I first started cooking a lot in college. I had nothing. No food processor, no vitamix, no mandolin ... I barley even had a sharp knife. I had one pot and no pans, which meant sauteing was done in a pot. YEP. Sometimes I'd even roast things in that darn pot. I always got it done. You know what .... it did not matter, because I loved to cook so much. This recipe is for my old college roommate, Kara, who willingly ate my home cooked meals back then ... the good ... the bad ... and the way too garlicky. 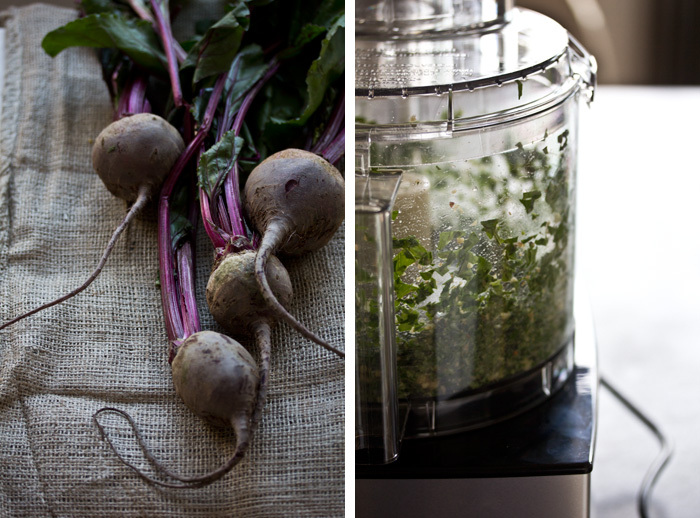 Kara will never forget my love for pesto and she recently requested that I do a beet / pesto recipe for the blog. Thankfully I have a much better grip on the garlic proportions now (note: less is always more). Since I know she probably will not make this for herself, this is my way of coaxing her to visit me in NYC. Gnocchi is easier to make than you might think. The ingredient list is short, and it is pretty hard to mess it up. The most challenging part is to get that dreamy, pillow-like texture. I give some tips in the recipe to tackle that. For this particular recipe, I used a gluten-free flour blend and I did not taste the difference from when I made gnocchi with whole wheat flour. If you would like to use all-purpose or whole wheat flour, just switch out the brown rice flour (same/similar proportions). You can also use an egg or not use an egg. I find that the eggs helps bind so that you use a little less flour, but if you do not want to use the egg, the recipe will work fine without it. 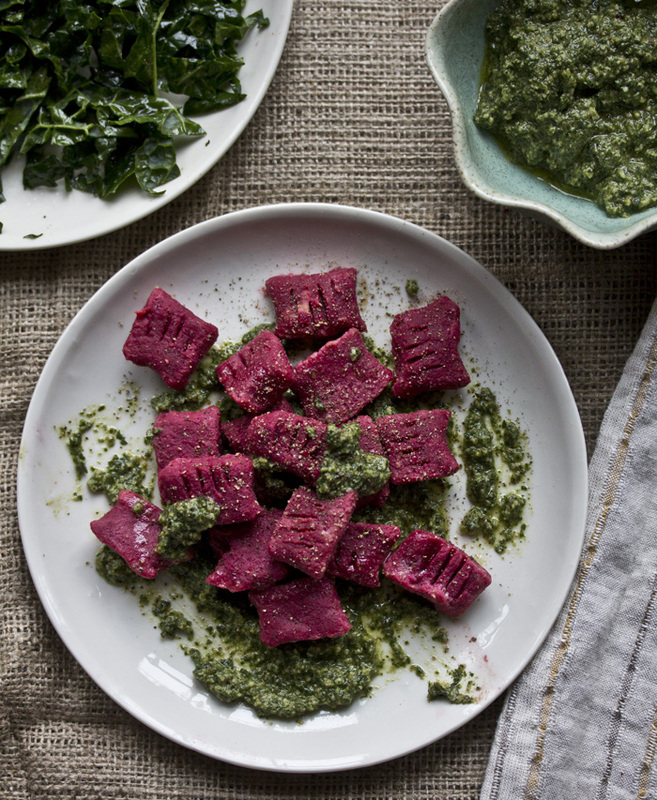 I just love the gorgeous color that the beets add to this dish. It would make for a great valentine's dinner for two, or this would also make a great meal for a friend who comes to town to visit (wink wink Kara).